Out of the Latitudes, ThinkPads, and EliteBooks, I find myself coming back to these things. This is my 5th EliteBook. Runs like a charm, though mine has some scratches and minor dings here and there. Everything works great though... and for $170 total, can't complain at all. Anyone else here a fan of EliteBooks and ZBooks? Re: Any EliteBook love here? 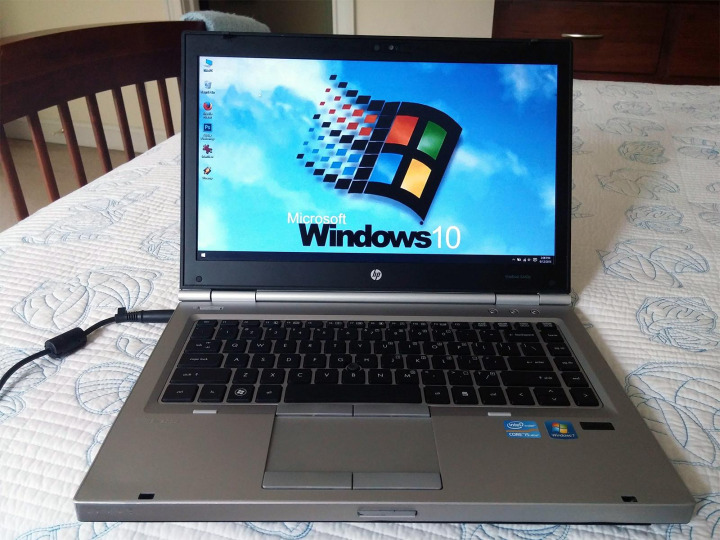 My dad has an EliteBook 8560p. Brilliant machine, better than the T520 IMO. Been thinking about getting one myself, although the crappy screen on the 8460p has been holding me off. 8740W with DC panel is one fabulous machine. The later 16:9 DC systems are nice, but that one is just WOW. Letdowns? Keyboard and temps when pushed hard. Regardless of these shortcomings, I'd argue that it was built as good - if not better - than any ThinkPad I've ever come across. They look good, they are durable, but no trackpoint middle button (on 14" and smaller models) and a pretty horrible keyboard (both feel and layout) turn me away from the Elitebooks. Ajkula - Tore it open the other day and dusted out fan, cleaned heatsink, redid thermal paste. Runs a lot quieter and cooler now. The keyboard layout is a bit weird and the 8*40 line definitely had better keyboards. I've had an 8560p as well. I'll be honest - I'm not impressed by any of the T*20, E6*20, and 8*60 screens. The HP one is somewhat ok though, for my purposes. There is nothing wrong with the specs and it is probably a great machine. But I find it very ugly with all that grey plastic but that is only a personal opinion. Also no trackpoint for me is a deal breaker. Yes it probably stands up well against similar spec and age Thinkpads. If I was trapped in a boring job with that in front of me I would go mad. shawross wrote: But I find it very ugly with all that grey plastic but that is only a personal opinion. Last time I checked, all plastic parts were black on the Sandy-Bridge machines. I have owned only one EliteBook, the 8740w (not with the DreamColor screen, unfortunately). It certainly feels incredibly premium and solid. Like ajkula66, I have yet to see a Thinkpad that's as well-built. But its flat chiclet keys are uncomfortable, and the rubber mouse buttons are terrible. I would rate it 10/10 for construction, but only 5/10 for usability. If it had the DreamColor panel, I might raise the usability score to 6/10, but that's still rather low. I did have an nc2400, which later evolved into the nc2510p and subsequently the EliteBook 2530p. That nc2400 was truly great, except for its slow 1.8" HDD and very washed-out TN screen. shawross wrote: Also no trackpoint for me is a deal breaker. Look at that photo again, more closely. Yes my bad there is certainly a nub on the keyboard. But I don't think I will ever find out how good or bad that keyboard really feels. I will stick with my Thinkpad keyboards with their middle button scroll. I liked the silver look of the NC2510p more than the NC2400, I hadn't this machine for long though so I cannot say much about it. Generally I don't like the HP keyboards so much, and the F-keys are tiny, even in the 8730w, where there would be plenty of space for a decent keyboard. The touchpad experience is also a forgetful one. The NC4400 was a tank! Bulky and sturdy! I used it for long as couch Notebook until I replaced it with an X61s. My favorite elitebook was the 2560p and 2570p I liked them more than my x220 because the CPU was still a socket and you could put in a quad core i7. Also thought the thermal cooling was a little better than x220. If they ever make a 1080p screen mod for the 2570p I would go back to it. never a fan of the elitebook keyboard. I am of a fan of Apple Macbook Air/Pro when i don't use ThinkPad. Maybe i should start a thread asking whether there are any Apple fans out there. lead_org wrote: never a fan of the elitebook keyboard. I am of a fan of Apple Macbook Air/Pro when i don't use ThinkPad. You do not do any real work when you are on Apple products, you just stare at it and marvel at the Apple logo. So crappy keyboard is okay, since you won't be typing anything. shawross wrote: There is nothing wrong with the specs and it is probably a great machine. But I find it very ugly with all that grey plastic but that is only a personal opinion. Also no trackpoint for me is a deal breaker. The body is brushed aluminum, not plastic. There's also an eraserhead on the keyboard. All four touchpad buttons are programmable so I just configure the top right one for middle click. oeuvre wrote: The body is brushed aluminum, not plastic. Indeed, EliteBooks use fancier material than most Thinkpads and Toughbooks, giving them a premium look similar to Apple laptops and Dell Precisions. Many people on this forum don't realize this, because most of the non-Thinkpads they have come across are consumer-grade craptops. But while I think most EliteBooks are well-built and quite tough, this premium-looking material doesn't age well since even the tiniest dings are very noticeable. This material is also quite heavy, which is one reason why EliteBooks tend to be heavier than their Thinkpad counterparts. Being obsessed with minimizing weight, this matters to me a great deal and is one of the reasons I have owned so few EliteBooks. I have some love to my 8740w DC. +1 QWT. When you get it from frosty outdors metal palmrest is very cool (not like on Thinkpads). But upper Keyboard Bezel is plastic. Strange things. Couple of times i have tried to open keyboard and can't until removed this keyboard bezel. After this one plastic latch have broken. But it have more screws to fix it in place. oeuvre wrote: There's also an eraserhead on the keyboard. I can't configure middle button for normal trackpoint-like scroll action. In some apps it works but in some won't. pianowizard wrote: This material is also quite heavy, which is one reason why EliteBooks tend to be heavier than their Thinkpad counterparts. 8740w is smaller and lighter than W700/W701 and it is cool! 2x USB 3.0 and better video is better in HP. Cooling system of 8740w is worse than W70x's. 2 fans is better than 1 but slightly bigger. And modern FLEX cooling system of P70 can be even better (in theory;). As my signature indicates, count me in as an EliteBook fan--I have the 8460w workstation variant of the original poster's machine, which gave access to higher-spec quadcore i7 processors and a FirePro graphics card (the latter being the draw for me, as I was at the time doing considerable CAD modeling/analysis for work). Oh, and it's a darker "gunmetal" type color, with an illuminated HP logo on the lid (silly, I think) and a bright orange point stick nub to differentiate at a glance from the mainline -p model. As far as I could find, it was the only 14" workstation class machine on the market when I was buying, which made the purchase an easy decision. I was delighted to find that it has met or exceeded my expectations on almost all fronts vs ThinkPads, so far as what matters to me. It is, as indicated, a bit heavy, due to the almost entirely metal construction...but the build quality far outstrips the contemporary T520, and as memory serves, is at least as good as a T60. While thinner and lighter are certainly convenient for travel, it's still plenty small enough to easily carry around. 2.36kg (with optical drive) isn't too much to ask for a full-featured mobile workstation with high specs and adequate cooling. There is delightfully easy access to all internal components via toolless (unless using security screw) removal of the magnesium bottom plate. It's as modular as an old ThinkPad, with socketed processor, standard RAM slots, ExpressCard 54, swappable drive bay (with battery option to replace optical/hard drive caddy--something that disappeared from mainline ThinkPads years ago), etc. As noted by previous posters, the 14" (and smaller) EliteBooks lack a third button for the pointing stick, but the software for it allows for reconfiguration of the buttons to rectify this: my personal solution is to disable the touchpad (excellent glass one far better than a T520 for the record) while using the four buttons for left-click, right click, middle-click, and scroll (going clockwise from upper left button). There are two standout flaws in the machine: the keyboard light, a springloaded hidden device above the screen in lieu of a thinklight, is fragile and laughably dim/weak. This could have easily been fixed, but as a touch-typist doesn't impact me dreadfully. The more important flaw plagued all 14" models of the generation: a dismal LCD panel. The 1600x900 resolution is adequate (though I'd have preferred a 1080p option, if not 16:10), but the contrast ratio and viewing angles are horrid. The same, of course, was true of the competing T420(s) etc. Just luck of the draw for a bad year of panels, sadly. I understand the larger models offered displays ranging from good to fantastic (DreamColor). The keyboard is good, with a far more sane layout than the current ThinkPads. Key feel is fine, but not standout good. A classic ThinkPad keyboard is far superior in layout and feel, but I had little trouble switching from a T520 (right layout but not as good as the older ones in feel) to it. As indicated above, this was really the only small workstation-grade machine on the market when I was looking. A high-spec full-voltage quadcore processor is quite convenient for on-the-go FEA work (heavy iterative math), and the pro graphics was a must. Today the full-featured 14" workstation spec is basically gone, since Lenovo can't seem to do a machine without thermal throttling (nixing the T440p), and HP made the Zbook 14 a thinner/lighter model without a swappable/optical bay. Thus I expect/hope to use my 8460w for years to come yet, with the only conceivable replacement being the Ivy-bridge refresh 8470w (the same model but for an updated graphics card and processor): an upgrade not worth the money unless something catastrophic happened to my machine thus necessitating a replacement. I'll probably upgrade to 16GB of RAM before too long though, which along with the i7-QM and a nice enterprise-grade Intel SSD, pretty much maxes out the little beast. And Tasurinchi: the 25x0p models are fantastic. I'd recommend the 2560p, as it's the last one with lid latches, and can be had with a surprisingly well-cooled Sandy Bridge full-voltage quadcore i7 if desired. An optical drive/swappable bay in a machine that size is pretty cool too The only letdown is the 1366x768 display, but you'd have to go to newer models to do much better in the 12" class anyway.